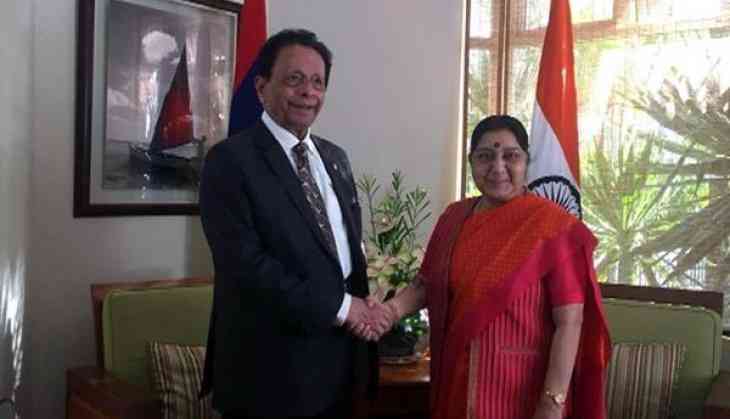 External Affairs Minister Sushma Swaraj, who is on a five-day visit to South Africa, on Friday met Minister Mentor of Mauritius Sir Anerood Jugnauth, who is also the Defence Minister of Mauritius, to strengthen maritime cooperation. During her transit stay in Mauritius, leaders shared views on strengthening maritime cooperation between two countries, tweeted official spokesperson of Ministry of External Affairs (MEA) Raveesh Kumar. "During her transit stay in Mauritius, EAM @SushmaSwaraj interacted with Minister Mentor of Mauritius Sir Anerood Jugnauth who is also the Defence Minister of Mauritius. Leaders shared views on strengthening maritime cooperation between two countries," Kumar tweeted. On Thursday, Sushma Swaraj travelled in the historic first-class compartment of a train from the Pietermaritzburg railway station, from which years back Father of Nation Mahatma Gandhi was thrown out by a Britisher. This formed the last leg of Swaraj's visit to South Africa, as the part which she earlier inaugurated a bust of Father of Nation Mahatma Gandhi and a model of charkha at the railway station. Swaraj was accompanied by a score of people, clad in white Khadi cloth. She earlier visited the digital version of a museum dedicated to Mahatma Gandhi. This museum was inaugurated by Prime Minister Narendra Modi during his South African visit in 2016. On Wednesday, while addressing the audience at the railway station, Swaraj recalled the contributions made by Mahatma Gandhi and anti-apartheid crusader Nelson Mandela in starting a movement for independence and anti-racism respectively. She also launched a coffee table book, titled "The Birth of Satyagraha". Swaraj earlier went to Johannesburg to attend the BRICS ministerial meeting and the IBSA (India-Brazil- South Africa) meeting.